Two-time Olympic gold medalist, FIFA Player of the Year and World Cup champion Carli Lloyd spoke recently about her love for Liverpool FC and why she supports the club. 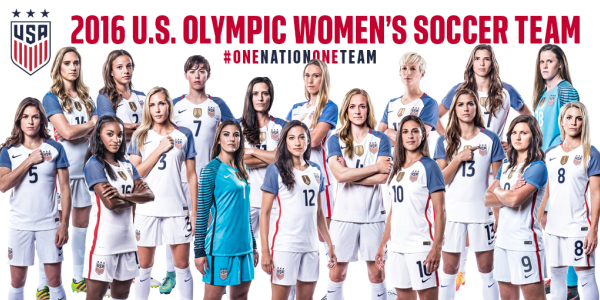 The U.S. Women Olympic soccer team was announced Tuesday. The roster includes seven players from the 2012 team that won gold at the 2012 Olympics and 14 players from the last year’s World Cup championship team. The U.S. will face Costa Rica, July 22 in Kansas for a final Olympic send-off match. The team opens Olympic play Aug. 3 against New Zealand. Moving forward? U.S. striker Abby Wambach and other American players may have a harder time figuring out how to move their career ahead with few options looming over the next three years or so (Photo by Staff Photographer Sean Hiller). The New York Times had more on the timing o a new coach — and possible new women’s league — here. 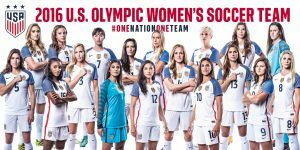 *Rolling Hills Estates’ Whitney Engen was named today to the Women’s Professional Soccer Best XI, along with former LA Sol star Marta. Engen is a defender for the Western New York Flash, which won the league title last weekend. She was also earlier named WPS Defender of the Year. Hermosa Beach resident Abby Wambach was also named to the WPS team. *Are there too many international fixture dates? A consortium of European clubs say yes – and are demanding changes. *According to several different sources, former D.C. United Coach Curt Onalfo is replacing Cobi Jones as an assistant coach at the Galaxy. There’s been no confirmation from the Galaxy and no reply to an e-mail inquiry I made this morning. *Pasadena City College product Yura Movsisyan looks to be headed to a Russian team from his current Danish club. *Finally, former LA Sol striker Marta has signed a contract with WPS expansion club the Western New York Flash, which is based in Buffalo, the club announced Tuesday. It’s the third WPS club in three years for the 25-year-old Brazilian striker, the league MVP in its first two years of operation and the reigning and five-time FIFA World Player of the Year. She played last year for FC Gold Pride in the Bay Area, which won the WPS title and promptly ceased operations, following the Sol into oblivion. So that’s the kiss of death for the Flash then. 1. Onalfo’s hiring was confirmed by Coach Bruce Arena. 2. Jack McBean’s signing (see this earlier post for details) was also confirmed. He will join the Galaxy in camp in mid-February once U-17 World Cup qualifying is completed. 3. A 22-year-old Argentine midfielder named Miguel Lopez, who was a teammate of MLS draft pick Paolo Cardozo at Quilmes, will join the Galaxy in camp next week. Brazilians one year, Argentines the next for the Galaxy, I guess. 4. Jamaican goalkeeper Donovan Ricketts has received his green card, meaning the Galaxy are in compliance with MLS rules regarding international players on the roster (a regular blog reader was fretting about that the other day). Reporter Phil Collin will have more in the dead tree edition tomorrow. *The Galaxy announced today they have re-upped midfielder Jovan Kirovski, 34, on a new one-year deal. His option was initially declined by the club and he has presumably re-signed with a cut in pay, although terms were not announced. The Escondido native is in his second stint with the club and scored four goals last season in a reserve role. *Chivas USA announced today they have declined the contract option on striker Giancarlo Maldonado, 28, who joined the club on loan last summer from Mexican First Division club Atlante. The Venezuelan forward found the net just twice in MLS. *Carson’s Home Depot Center will host a Monday, June 6 Gold Cup game, CONCACF announced today in naming the venues and schedule for next summer’s regional championship. The confederation had announced previously that the Gold Cup final will be played at Pasadena’s Rose Bowl, which will undergo a major renovation in the new year, before the tournament is held. *Upland resident Lauren Barnes of UCLA has been ranked as the second-ranked defender available in the WPS draft set for Jan. 14. Last Monday’s Barclays Premier League match, a 1-0 home win for Manchester United over Arsenal, was seen on ESPN2 by an average of 438,000 homes (570,000 viewers) making it the most-watched Premiership telecast on U.S. cable television, according to Nielsen. The telecast outdelivered the previous high – 420,000 homes (526,000 viewers) for Manchester United vs. Chelsea on Saturday, April 3, 2010. The game had a 0.4 rating. ESPN averages a 0.3 rating for EPL games. Tuesday’s column: Press more of a sure thing than women’s game? It’s time to look back and reassess; it’s time to look forward and plan. It’s not always easy – even if you’re one of the best female soccer players in the nation like two-time Daily Breeze Player of the Year Christen Press, right, of Palos Verdes Estates. As if to confirm the uncertainty of women’s soccer in this country, as I wrote this week’s column Monday the Chicago Red Stars of WPS folded citing a lack of investment related to the demise of other teams such as FC Gold Pride. It’s hard not to conclude the WPS dominoes are falling, one by one. It was against this backdrop that I spoke to Press Monday at the opening of the U.S. Women’s Under-23 national Team about her career so far and her future pro prospects. Press said that absent a California WPS team she’d like to play in Washington with the Freedom to be near her two sisters next year. The Freedom nearly folded this year. I hope she gets her wish. And the groups are: Next summer’s Women’s World Cup schedule is set after today’s draw in Frankfurt, Germany (AP Photo). 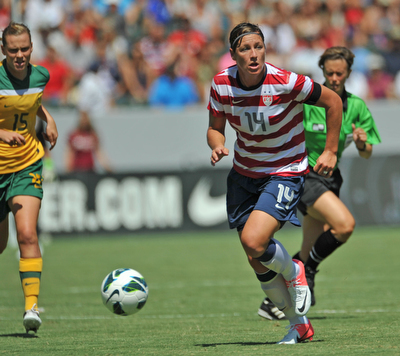 *More details on today’s draw for the 2011 Women’s World Cup in Germany are here. The United States wound up with what could be the toughest group at next summer’s Women’s World Cup, drawing North Korea, Colombia and Sweden on Monday. The top-ranked Americans were the last team to qualify for the 16-nation tournament, beating Italy in a home-and-home playoff on Saturday after being stunned by Mexico in the semifinals of regional qualifying. Still, the U.S. is a top seed, as are two-time defending champion Germany, Japan and Brazil. The tournament will be played June 26 to July 17 at nine sites in Germany. Sweden is No. 4 in the latest world rankings while North Korea is sixth. Germany is the only other seeded team to draw two top-10 opponents, with No. 8 France and No. 9 Canada joining Nigeria in Group A. The U.S. opens June 28 against North Korea, the fourth straight time these nations will meet in the group stage. The Americans beat the North Koreans 3-0 in 1999 and 2003, but tied 2-2 in 2007. The North Koreans have had impressive results at the youth level, winning the 2006 Under-20 and 2008 Under-17 World Cups. North Korea was the runner-up to the Americans at the 2008 Under-20 World Cup. The U.S. will face World Cup newcomer Colombia on July 2 and finish group play four days later against Sweden, the team Sundhage played for at the 1991 and ’95 World Cups. The Americans won the World Cup in 1991 and 1999 and have finished no worse than third. They also are the defending Olympic champions and have won all but one gold medal since women’s soccer was added to the Olympic program in 1996. *In other women’s soccer news, the Sol have returned – sort of – and will field pro teams, one in the Bay Area, the other in Orange County, in the largely amateur Women’s Premier Soccer League. Former Sol Coach Abner Rogers will coach the Southern California Sol. *A belated tip of the hat to Palos Verdes Estates’ Christen Press, who just can’t stop scoring for Stanford in the NCAA Tournament. Ronaldinho: Galaxy target? (AP Photo). Ronaldinho is coming! Ronaldinho is coming! Ronaldinho is coming! Or not. (Where he stops, nobody knows). Today’s column looks at the Galaxy’s recent roster moves and summarizes the recent speculation around AC Milan’s Ronaldinho coming to LA as the club “entertains” the idea of signing a third designated player before the closure of the international trade window next week. Oh, and Becks returns to training with the Galaxy today Wednesday, Galaxy officials said today, correcting what I was told Monday. *Continuing with the theme of speculation, England’s tabloid Daily Mirror notes the resignation Monday of Aston Villa manager Martin O’Neill and immediately concludes without any attribution whatsoever that U.S. Coach Bob Bradley is the favorite to succeed him (because Villa’s owner is American) and that he will bring son Michael Bradley and the Galaxy’s Landon Donovan to the club if he takes the job. Quite a leap. *Bradley will be at the helm of the U.S. team against Brazil at 5 p.m. tonight in New York (live on ESPN2 and Univision) where Galaxy defender Omar Gonzalez could make his international debut. There are eight Californians on the roster including Anderlecht’s Sacha Kljestan, Galasgow Rangers’ Maurice Edu and Pachuca’s Herculez Gomez. *Other local players involved in internationals this week include Galaxy goalkeeper Donovan Ricketts, called into Jamaica’s camp for the Wednesday game against Trinidad & Tobago, while Pasadena City College product Yura Movsisyan looks likely to make his debut for Armenia Wednesday against Iran. Chivas USA’s Michael Umana also plays for Costa Rica Wednesday against Paraguay. *Not to be left out, Galaxy Coach Bruce Arena and former Chivas USA coach Preki will be inducted into the U.S. Soccer Hall of Fame before the U.S.-Brazil game. *Finally, Rolling Hills Estates’ Whitney Engen, a rookie defender with the Chicago Red Stars of WPS added the ACC Women’s Athlete of the Year award last week to her burgeoning trophy cabinet, after previously being named the top female college soccer player in the nation by winning the 2010 Honda Sports Award.